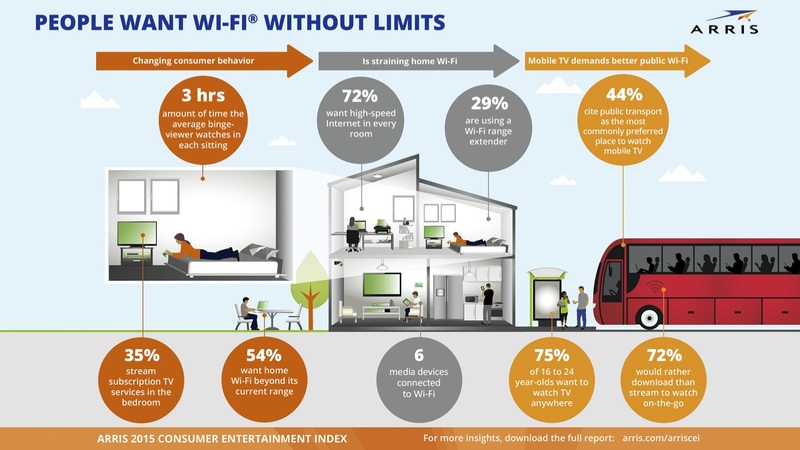 Consumer demand for a life without wires is a key challenge that occupies us at ARRIS. We’ve become accustomed to an untethered world. 20 years of Wi-Fi and wireless innovations have certainly seen to that. Driving home the point even further: our last Consumer Entertainment Index revealed three quarters of those aged 16-24 want to watch TV anywhere. We’re therefore excited when we can share how we’ve helped even more people go wireless. This is now the case for customers of MultiChoice, which has launched its latest DStv WiFi Connector solution. This gives DStv customers in South Africa and Sub-Saharan Africa the ability to enjoy connected services such as video on demand with DStv Catch-Up Plus, Remote Recording and ShowMax, South Africa’s premier streaming service, through their existing decoder, wherever it is in the home. In simpler terms, it means the convenience to connect your TV experience in any room in the home, without the need to run cables. We're seeing greater demand from consumers who wish to unlock the added value that comes from conveniently connecting their decoders or set-top to the internet. This solution is designed to perform in today's digital home: simply attaching the sleek USB stick to the DStv Explora opens up a whole new world of content to MultiChoice customers without the need for an Ethernet cable. The new DStv Wi-Fi Connector, developed by ARRIS, features the latest 802.11ac Wi-Fi technology to provide reliable HD quality video and backwards compatibility for older Wi-Fi networks.